The Big Moon played the Magnet and Getintothis’ Lauren Wise caught up with them to chat about touring, backing Marika Hackman and pop. It has been one heck of a year for The Big Moon. After their Mercury Prize album nomination, they took to touring for the majority of the year, including a pit stop at Liverpool’s The Magnet during their UK tour. 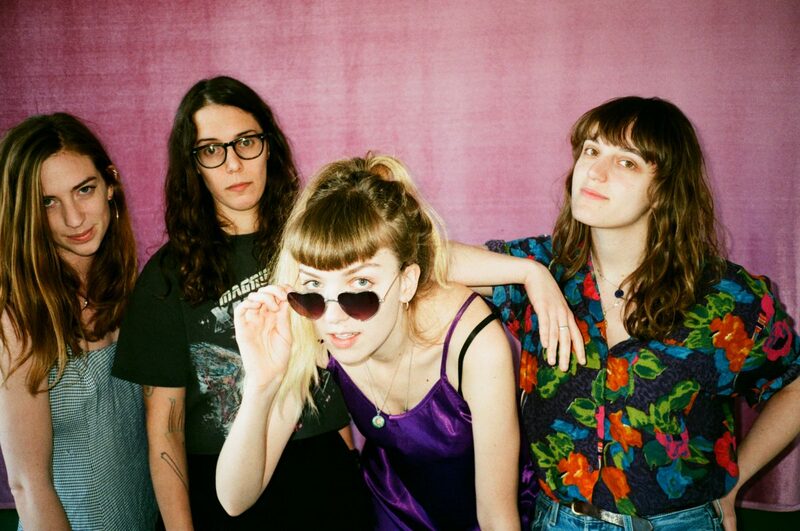 We got the chance to chat to bassist Celia Archer and drummer Fern Ford to see how the tour has been treating them, what their favourite part of being in a band is and providing backing for Marika Hackman. Downstairs in The Magnet is a secret third bar, closed off from punters, acting as an exclusive VIP space for the headliners of the night, The Big Moon. After a welcoming hug from bassist Celia and a quick scout around only to see a lack of available perches, there was nothing for it but a cosy interview on the floor. Getintothis: How’s the tour going? Getintothis: I was just asking how the tour’s going? Getintothis: You haven’t lost your mind yet? Getintothis: And you went on tour in North America with Marika Hackman earlier this year, how was that? Celia: “Yeah, we were doing our set and then playing for her as her band as well because we were on her album so it was the five of us and we had a lady out there called Rachel, who was amazing, who was doing sound for us. We didn’t have a tour manager, we didn’t have anyone to help with the gear, Jules had hurt her back, Soph hurt her back by the end, so it was a very exhausting tour, but the shows were amazing. Getintothis: What’s it like performing your own music compared to backing for someone else? Getintothis: How does recording the album (in 12 days?!) compare to doing so much touring? Celia: “Well we recorded the album live. All the basis of the tracks is that we go into a room and we play it all together at the same time so the reason we could do it so quickly is because of the amount of touring we’ve done of those songs – for most of them, a few of them not, but mostly. Celia: “I love touring. I like the immediacy of the reaction that you get and getting to meet people after the show. It’s one of my favourite parts of doing this job. Getintothis: You toured with Inheaven and VANT in 2015, what was your reaction when you heard VANT’s plans to split? Getintothis: What was the music you grew up with? Getintothis: Did you have one band you loved most? Getintothis: Do you have particular female inspirations as well? Celia: “I saw 10 Things I Hate About You when I was like ten and my Dad said it was the first film I saw where I was trying to decide who I was going to be or becoming aware of what I was interested in. Getintothis: What have you got going on after the tour?